In June we broke ground for the new parking lot and now we have a parking lot! (Actually, we're about 85% complete, but it looks like a parking lot.) With the 2nd layer of asphalt, the light poles, landscaping and some painting to be completed we'll soon be done with this project. Well before the weather gets cold and the sidewalks get slippery, we will be able to park in the lot and begin to appreciate what a great addition to our facility this will be. The fencing (to the left ) will fully enclose the lot. Other landscaping is being planned. 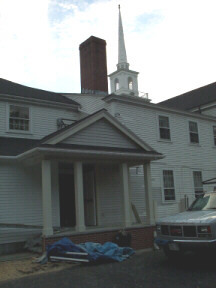 In the rear of the church we will have a new entrance (shown here - work still in progress). To the left there will be a walkway of engraved brick pavers which will provide an attractive approach to the ramp. These pavers are a great way to remember a loved one, honor someone you know, symbolize your involvement in the project. Please consider buying some brick pavers to support this project. These bricks are first quality and come in 2 sizes: 4" by 8" - $75 each and 8" by 8" -$125 each. Make your check payable to Centre Congregational Church. Thanks to very dedicated folks who have worked on this project for so long, and especially this summer, especially to Chuck Cotting, Rick Carey , Marcia Imbrescia and Phil Johnson.